When thinking of H. H. Holmes in contemporary views, one rarely looks to the Victorian authors of classic literature as a model of how we see the world through modern eyes. This does cause me to wonder if Poe and other great classic authors of horror and literature of a diabolic nature, knew of the devils future arrival and the future devastations brought about by Dr. H. H. Holmes. 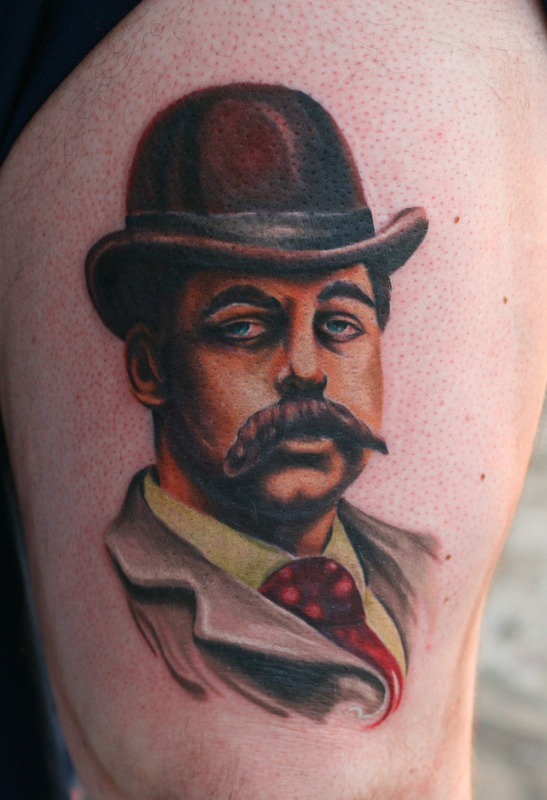 An artist has shared his rendition of H. H. Holmes in a very unique fashion – – skin art! DJ Minor a professional tattoo artist rendered his interpretation of psychopath serial killer H. H. Holmes (pictured below). To my knowledge, and I did research this exhaustively, this is the only rendition of Holmes in the art form of a tattoo in existence. 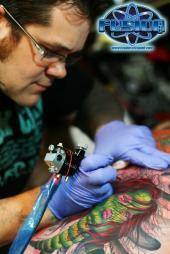 DJ Minor travels the nation and he is in high demand as his graphic art captures the essence of the human condition. One look at the tattoo above and you immediately notice the famed derby hat, hypnotic eyes and low-slung mustache of H. H. Holmes. I attempted to contact the artist; however, he is so busy, I was unable to reach him for an interview. The one question I would have like to ask, which was perhaps more suitable for the recipient of the tattoo; what was the motivation behind getting a tattoo of H. H. Holmes? Of course I would also have liked to know more such as; what, if anything were you (the artist) or the recipient experiencing during the process? Maybe DJ or the recipient of the tattoo will read this blog and decide to inform us more about this contemporary gothic depiction of, if not the most, one of the most prolific psychotic serial killers of all time. I too sport tattoos, thirteen to be exact, but the most gothic I have are the classic skull and crossbones and a piece I drafted the artwork for; an icy frozen cross on a burning flaming sea of water with my children’s names circling the cross. No, it never crossed my mind to tattoo myself with the likes of H. H. Holmes, but I do have to admit, artists like DJ Minor really make me reconsider my decision about the tat’ of the Tasmanian Devil I have been living with on my chest – – I can see it now… Nathanial Hawthorne, Edgar Allan Poe, Vincent Price, and Alfred Hitchcock sitting at a bar, in an absinth and laudanum induced state, discussing their latest endeavors and philosophy on the afterlife. As for now, I will continue to embrace the art of DJ Minor from afar and hope his genius and extraordinary talent continues to inspire artist of all backgrounds to tap into history and find ways to preserve our past, the good and the horrific. With no remembrance of people like the villainous Holmes, we have nothing to base the good upon! My hat’s off to DJ Minor! Thanks for the mention Rebecca!